Full day program on adhesion and dental materials. Evening Lecture for Suffolk County Dental Society on Direct Composites. Sponsored by Suffolk County Dental Society and 3M ESPE. Two full day lectures for master level AGD held at Maritime Conference Center in Maryland on various topics including occlusion and comprehensive dentistry, materials, adhesion, and porcelain veneers. Full day meeting on Occlusion and Comprehensive Dentistry held at NJHPDI (201-342-2204 for details). Full day program sponsored by the Long Island Center for Advanced Dentistry. 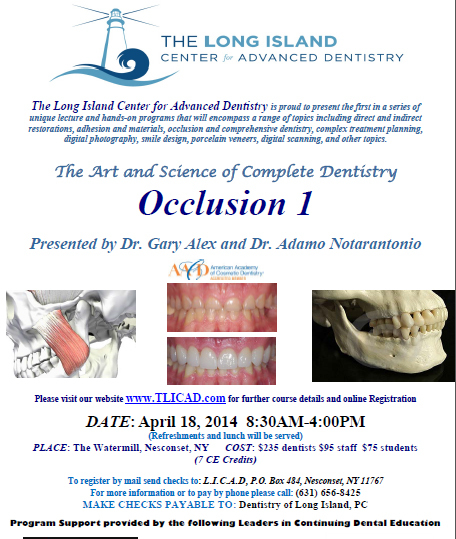 First in lecture series by the “Long Island Center for Advanced Dentistry”. Program one will be on the placement of posterior and anterior direct composite restorations. Adhesive systems, dynamics of composite polymerization, anterior layering techniques, materials, and much more will be covered. Full day program “The Marriage of Esthetics, Occlusion, and Comprehensive Dentistry”. Lecture and hands-on program. Sponsored by NJHPDI (New Jersey Health Professionals Development Institute). Evening program on composites and adhesives. Contact: Dr. Bill Campbell (wcampbel@optonline.net). Indiana (October 11th). Full day lecture on occlusion, esthetics, and comprehensive dentistry. Hosted by Dental Study Club of Northwest Indiana. Contact: Lisa Jarzombek ljarz@comcast.net. Full day program on occlusion. Florida (city to be determined): Dec 6,7. Program with Dr. Bob Margus of various aspects of composite and adhesive dentistry. FULL DAY: AM program-Porcelain Veneers planning to placement. PM program- Hands-on program on adhesion and direct posterior composite restorations (sponsored by BISCO and TrioDent). 3M ESPE Opinion leader Meeting. September 8-11 Chicago: BISCO Opinion leader meeting. October 7-9 Las Vegas:Opinion leader meeting sponsored by Triodent. Nov 27 Greater New York Dental Meeting:Dr. Alex will be presenting several programs on the placement of direct composite restorations. Sponsored by 3M ESPE. “Smile Long Island” full day program with 5 dynamic speakers. Program is sponsored by Coltene Whaledent. Dr Alex will be speaking on direct composite placement and adhesive systems. This will be a fabulous day covering a number of topics. Call Nancy Vesce to register (631)-406-7212. January 25-29 Maui, Hawaii – “Adhesive Dentistry Update.”Comprehensive program by Dr. Gary Alex, Dr. Ron Jackson, and Dr. Byoung Suh on various aspects of adhesive dentistry including porcelain veneers, posterior and anterior direct composites, bonding to Zirconia, etc. Call: 800-563-6252 or 604-689-3446 to register. February 25 Farmingdale, NY – “Porcelain Veneers: From planing to Placement.” Evening program at Marotta Dental Studio. Call 631-249-7520 to register. April 21st Huntington, NY – Greater Long Island Dental Meeting. Three hour evening lecture on direct composites and porcelain veneers. Sponsored by Coltene Whaledent. April 26-30 Grapevine, Texas – AACD annual Meeting (these are great meetings). Dr. Alex will be conducting three hands-on programs. 1) Face-Bow Transfers and CR bite records; 2) Direct Posterior Composites. 3) Cementation of indirect restorations. AACD.ORG to register. Dr. Alex will be conducting a hands-on program on adhesion and direct composite restorations. Presented by Dr. Gary AlexPatient demand for cosmetic dentistry has never been greater. This has led many dentists to invest considerable time, effort, and money, mastering various cosmetic procedures and techniques. While this is commendable, it should be recognized that it is one thing to be able to make pretty teeth, and an entirely different thing to make pretty teeth that actually last and function in harmony with the rest of the masticatory system. An acceptable cosmetic result, without regard for function and/or parafunction, will often result in premature case failure. What the truly successful clinician of today requires is a logical and systematic methodology in approaching cosmetic/restorative cases that will lead to a reasonably predictable and durable end result. This requires a practical understanding of fundamental occlusal principles, materials, and more importantly, just how to use them. This program will stress the concept of comprehensive dentistry and show how to predictably treatment plan and provide dentistry ranging from porcelain veneers to complex full-mouth reconstructions. This program is continually one of the highest rated programs at major dental meetings. Dr. Alex is past program director in occlusion for Esthetic Advantage and Pac Live. Lecture and hands-on programs on occlusion and comprehensive dentistry. Hands on and lecture on Porclelain veneers. This is the first of three programs sponsored by NYU School of Dentistry and Jason Kim labs. These programs will make you a better and more profitable dentist. Topics to be covered over the three courses include, occlusion, adhesion, cements, porcelain veneers, treatment planning, simple and complex reconstructions, and LAVA and other zirconia-core based ceramics. There will be live closed circuit patient demonstrations (preparation and placement of veneers and/or zirconia crowns) as well as attendee hands-on experience using dentiforms. Please contact Menzel (menzel@jkdentallab.com 516-828-4933) for more details and to register. Other programs in this series to be held May 8th and May 15th. Second program in three course continuum sponsored by NYU School of Dentistry and JK Dental Lab (see April 3rd for details). MAY 13th – Paramus, New Jersey: Full day program on “Occlusion, Comprehensive Dentistry, and Esthetics”. Sponsored by Bergen Oral and Maxillofacial Surgery Associates. Contact Karen Ferguson at 201-488-3976. Third program in three course continuum sponsored by NYU School of Dentistry and JK Dental lab (see April 3rd for details). AACD National meeting. Dr. Alex will be running two lecture/hands-on programs. The first one is sponsored by BISCO and will deal with techniques for the successful placement of Porcelain Veneers (Wednesday program). The second course (Monday) is sponsored by WhipMix and will deal with ways of finding and recording finding Centric Relation and just how to use a facebow (this program is sold out). You can register for these programs by going on the AACD website (AACD.ORG). The successful integration of prosthetics, cosmetics, interdisciplinary dentistry, and occlusion, is a powerful combination that can elevate your practice to new levels of care and service. This program will tackle fundamental occlusal principles and find answers to many of the questions you’ve been asking. What exactly is the difference between centric relation (CR), centric occlusion (CO), and maximum intercuspation (MIP)? How do you find and record centric relation? When is it acceptable to use MIP as opposed to CR? How important is anterior guidance? Where do you start in full mouth rehabilitation? What about other occlusal philosophies? What’s this “envelope of function” stuff all about? How come face-bows are so important? This program will provide a rational and methodology for tackling difficult restorative, prosthetic, and cosmetic cases. The program consists of a five hour lecture followed by an intensive full day hands-on program the next day. This program was one of the highest rated and best-attended programs at the recent 2005 Chicago Midwinter meeting as well as the AACD 2002 and 2004 national meetings. It was taught at both PAC live and Esthetic Advantage Masters programs in occlusion and comprehensive dentistry where Dr. Alex was program director. Dr. Alex has been described as one of the best teachers in dentistry today. The hands-on part of the program is limited to ten dentists. Febuary 6-10: Puerto Rico (Annual Dental Convention). Lecture on Various topics. Full day on Occlusion and Comprehensive Dentistry. April 25-26: Tufts University Dental School (Boston, Mass.) – Two day program post graduate lecture and hands-on program on Occlusion and Comprehensive Dentistry. Sponsored by Tufts University Dental School. May 6-10 – New Orleans, Louisiana: AACD National meeting. Dr. Alex will be conducting several hands-on programs. May 14 at Stony Brook University Dental School Long Island NY:Three hour lecture/discussion on porcelain veneers and comprehensive dentistry. Contact the dental school for details (631-632-3054). September 19th Birmingham, Alabama: Full day program entitled “The Marriage of esthetics, occlusion, and comprehensive dentistry.” Sponsored by The University of Alabama School of Dentistry(205-996-6494) . October 16 and 17 – Charlotte, North Carolina: Thursday evening program on direct composites followed by full day program Friday on Occlusion and Comprehensive Dentistry (AM) and Porcelain Veneers (PM). Call Mehul Gadhia for details 704-541-8090 (drgadhia@bellsouth.net). October 24th – Port Washington, Long Island:Three hour afternoon program on “The marriage of occlusion, adhesion, and cosmetic dentistry”. Presented at the new teaching center at Jason Kim Lab – call Menzel at 516-829-4933 for details regarding the program and venue. November 21- Virginia: Full day lecture entitled, “Occlusion and Comprehensive Dentistry: The Power of Centric Relation” and “Porcelain Veneers: Planning to Placment.” Sponsored by Northern Virgina Dental Society (703-642-5297).